On February 15, 2013, a fireball exploded over Chelyabinsk, Russia, with a force twenty to thirty times larger than the bombing of Hiroshima. It was the largest known asteroid to enter Earth's atmosphere since the 1908 Tunguska blast over Siberia, yet it had not been detected until entry. "The question is not whether an asteroid has Earth's name on it but rather which one and when?" This sobering sentence opens one chapter of Donald K. Yeomans' Near-Earth Objects: Finding Them Before They Find Us. 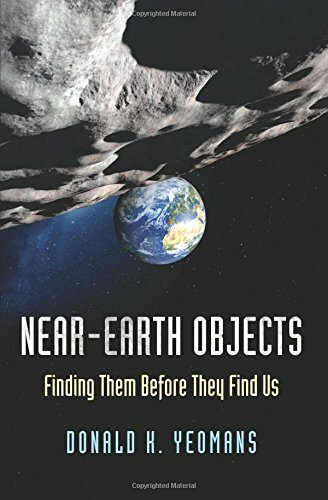 Yeomans, a fellow and senior research scientist at the Jet Propulsion Laboratory (JPL), introduces us to our closest neighbors, the asteroids and comets that approach Earth's orbit. Their scientific and mineral value alone is staggering. As Yeomans writes, asteroids are "older than dirt," offering a window onto the origins of the solar system 4.6 billion years ago. Asteroids and comets may have also delivered the organic materials necessary for life on Earth. Further, Yeomans estimates that a single 1km asteroid could yield platinum, nickel, and iron worth $5.5 trillion, more than has been collected over all of human history. With regard to human life, an asteroid or comet impact is a classic "low probability, high impact" event. While small objects enter the atmosphere (and burn up as shooting stars) every day, the Earth can go millions of years between strikes like the one that killed the dinosaurs. A 1km object, however, would kill billions of people, and a 10km object would likely cause a global extinction event. Systematic search programs have dramatically increased the rate of discovery of NEOs and lowered the risk of impact. As of 1990, only 134 NEOs had been discovered. Today, more than 8,800 have been identified. No large asteroid yet discovered is likely to impact Earth within the next 200 years, though the asteroid Apophis will pass within the orbits of communication satellites on April 13, 2029. An object's path would need to be altered only slightly to transform a catastrophe into a harmless fly-by. Yeomans offers several feasible suggestions for such a mission, but success would depend on early detection and thorough analysis. The worst-case scenario would be a large long-period comet heading toward Earth. Long-period comets are practically invisible until they pass Jupiter, at which point we would have only nine months before a potential impact. A greater problem could be the political question of who is responsible for coordinating a deflection mission. On October 6, 2008, astronomers at the Minor Planet Center, JPL, and NASA detected a small asteroid that would explode over northern Sudan in less than 12 hours. They suggested that US officials contact the Sudanese government to prevent panic and request permission to collect meteor fragments. Because of a lack of formal relations between the two countries, however, no one in Sudan could be contacted in time. This meteor exploded harmlessly, but imagine the consequences of a giant fireball over Pyongyang, or the United Nations debate over deploying nuclear weapons in space to deflect an incoming comet. International collaboration among astronomers offers a model for political cooperation, and one hopes that political conflicts won't prevent us from saving human civilization. Micheal W. Hickerson lives in Cincinnati, Ohio, and writes regularly for InterVarsity's Emerging Scholars Blog.